Israeli jets struck several sites in northern Gaza on Sunday, as Israel blamed Hamas for launching a missile into Ashkelon and ordered all Gazan border crossings to be closed. The Palestinians say a pro-Islamic State group is trying to provoke a war. 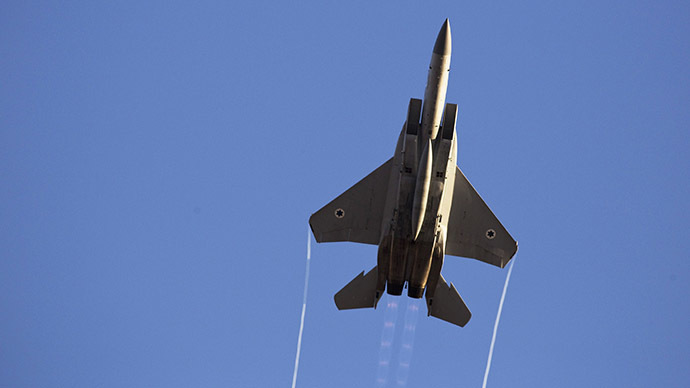 The IDF Spokesperson’s Unit said the Air Force has hit a number of “terror infrastructure sites” in the northern Gaza Strip, the Jerusalem Post reports. This was in direct response to a rocket fired on Saturday from Gaza, which exploded outside of Israel’s southern Ashkelon region in an open space. There were no reports of injuries or damage. It is the second time in days that Gaza has been bombed after obscure militants launched unguided missiles into Israel, with a similar scenario unfolding Thursday night. In both cases, the Omar Brigades, a radical Salafist group that has pledged allegiance to Islamic State (formerly ISIS/ISIL) claimed responsibility for the attacks. Hamas, which is the dominant Palestinian group in Gaza, has claimed that the Salafists are trying to spark another major conflict in the region to seize power. Hamas has reportedly hunted down and killed a leader of the rival group, while a Twitter account thought to be run by the Omar Brigades said Sunday that the latest strike was “in protest” against the imprisonment of their fellow jihadists in Gaza. However, Israel has said it will not take into account who exactly is responsible for attacks from a Hamas-controlled territory. “Even if the shooters last night were jihadist groups rebelling against Hamas by firing at us, we view Hamas as being responsible for everything that occurs in the territory of Gaza,” Defense Minister Moshe Ya’alon has said. Ya’alon on Sunday issued an order to close the only two operating border crossings between Israel and Gaza. The crossings – Kerem Shalom and Erez – will be opened only for humanitarian purposes until the security situation changes, the order said. The other three crossings into Gaza are still not operational. The latest attack near Ashkelon comes a day after the IDF deployed at least two Iron Dome anti-missile batteries in southern Israel. On Sunday, the US backed recent Israeli airstrikes, saying Israel has right to defend its people. “Clearly the US stands with the people of Israel as they defend their people and their nation against these kind of attacks,” White House spokesman Josh Earnest told reporters at a G7 summit in Germany. On Thursday, several massive explosions rocked the Gaza Strip amid reports of Israeli jets spotted in the area. The strikes took place in the western part of the strip, near the Maqousi Towers residential area. The last time Israel cut off Gaza completely was in November, as it shut down the Kerem Shalom and Erez border crossings. Rights activists say the border closures threaten the population of the already extremely isolated Gaza Strip, which has been in dire need of rebuilding and humanitarian aid since Israel’s deadly seven-week military operation in Gaza last summer, Operation Protective Edge, which claimed the lives of more than 2,000 Palestinians. The latest spike of violence in the region follows a relatively calm. Last summer’s brutal crackdown by the Israelis came after regular missile attacks on Israeli territory.